El Best Western Plus Altoona Inn se encuentra en el centro de Altoona. Venga y disfrute de las mejores atracciónes turísticas cerca de nuestro hotel. Precios bajos garantizados y ofertas exclusivas. Convierta este hotel Best Western Plus® en su segundo hogar durante su viaje para explorar las atracciones de la zona de Altoona. Nuestro hotel está situado a solo unos pasos del parque de atracciones Adventureland, el centro comercial de tiendas directas de fábrica Outlets of Des Moines, Bass Pro Shops® y el hipódromo y casino Prairie Meadows Racetrack®. Este hotel recién renovado de la zona central de Iowa ofrece el espacio de alojamiento idóneo para todo tipo de viajeros. Las familias apreciarán especialmente su estancia en el Best Western Plus® Altoona Inn ya que podrán disfrutar de toda la emoción del parque de atracciones Adventureland al otro lado de la calle. Los huéspedes podrán disfrutar asimismo de los vibrantes eventos celebrados en el hipódromo y casino Prairie Meadows Racetrack® (servicio de transporte gratuito) a solo 3 kilómetros de distancia. Este hotel de Altoona está situado a poca distancia del Wells Fargo Arena y el recinto ferial Iowa State, que acoge numerosos eventos anuales como por ejemplo la Feria Estatal de Iowa, la muestra de autos Good Guys Car Show, muestras de armas, exhibiciones ecuestres, ferias de artesanía y mucho más. Con una fantástica ubicación junto a la carretera I-80, nuestro hotel le permitirá asistir a uno de los numerosos eventos deportivos celebrados en la zona, entre los que se incluyen torneos de sóftbol, lucha libre y los eventos universitarios State Track Meet y Drake Relays. Nuestros huéspedes podrán visitar asimismo las tiendas Bass Pro Shops®, las carreras de autos en Newton y el Festival Pella Tulip Festival en Pella, Iowa. Los huéspedes en viaje de negocios apreciarán igualmente la ubicación de este hotel de Altoona a poca distancia de empresas locales como Iowa Interstate Railroad, Egan Company, Ziegler CAT® y varias sedes gubernamentales. El Best Western Plus® Altoona Inn ofrece un excelente servicio de atención al cliente. Tanto si se encuentra en viaje de placer como de negocios, nuestro personal tiene el firme compromiso de proporcionarle una estancia inolvidable. Nuestros apreciados huéspedes podrán disfrutar de unas modernas y amplias habitaciones equipadas con televisión vía satélite, acceso gratuito a Internet de alta velocidad, microondas y nevera. Este hotel exclusivamente para no fumadores de Altoona ofrece también una piscina cubierta climatizada, un gimnasio y servicio de lavandería. Los huéspedes podrán degustar cada mañana un desayuno completo gratuito. Si desea disfrutar de una fantástica estancia al mejor precio, realice su reserva hoy mismo en el Best Western Plus® Altoona Inn. "Convenient Hotel with Best Staff EVER"
The staff at this Best Western Plus is what makes it stand apart! Shelli was so helpful over the phone and remembered me when we checked in, and Corey! There's a reason so many reviews mention him! He's just the best - truly went above and beyond in the early morning hours! 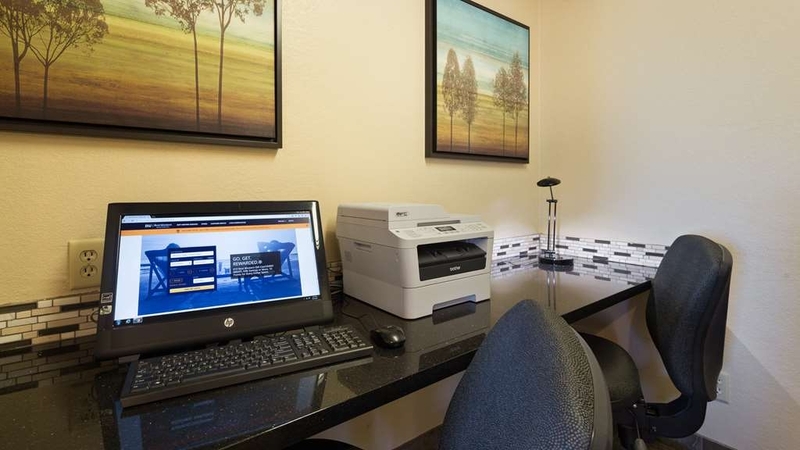 The hotel itself is conveniently located less than a mile from Target and Wal-Mart for any forgotten items, and several restaurants and outlet shopping are a short drive as well. We will definitely stay here again in the future - thanks for everything, BW staff! Nice hotel, clean rooms, Corey working overnight at the front desk was awesome. The breakfast was decent and the pool was nice. I would stay here again. This is our second stay here and would stay again. Great stay. Staff was very accommodating and helpful. Breakfast consisted of a wide variety, and they also had great biscuits and Gravy. Provided local maps and details on the local areas, along with favorite must-do activities. "staff at hotel very courteous and breakfast very good"
Great Staff. Corey was very helpful when I needed to extend my stay for a few extra hours due to adverse weather conditions . Corey went out of his way to make sure my stay was comfortable. The only problem I had was that my room was supposed to have a bathtub and I ended up with a handicap room with a walk in shower. I understand though as this was a very busy time and that was probably all they could provide me with. The morning breakfast was fantastic and all items that were warmed remained hot. the variety was very good. I would recommend this place to anyone as long as they didn't want a hot tub as this motel doesn't have one. This is the 2nd time I have stayed here on business. The first time 1 week and the 2nd 4 weeks. I work nights and had restful sleep during the day. Housekeeping was very responsive to my needs, I had a very nice breakfast when I arrived back in the morning and Corey was always friendly and always made sure that was freshly brewed coffee to start my night. We spent the weekend in Des Moines, is for the pigeon show, we go every year and stay at the best western in altoona, always happy the staff, the breakfast is very good and ready at 6 am, the rooms are clean and comfortable and the price is good. "A lot of broken items"
The hotel seemed clean enough. Staff sent us in the wrong direction for our room. He had us park on the wrong end of the building. So we had to literally walk all the way to the other end. Which was not really a long walk unless you have an issues walking in the first place. Our heat/air conditioning was a bit noisy, the vent in the bathroom did not work, and the bath tub faucet leaked (we couldn't hear it in the other room but still). Oh and they had outlets covered up by their head boards. "Second stay worse than the first"
My family stayed here about 4 years ago and we unanimously agreed to never stay again. Well, I broke that agreement and decided after this much time and reporting my problems before that they'd be better this time. I was wrong. Internet was absolutely awful, we got up early to hit breakfast before they ran out of stuff yet they still did, hot water and coffee were regularly out, room had no pluses to it, staff was not helpful. Even my teenage daughter questioned this hotel being a "plus". There was no pluses about it. We were Highly disappointed....again. They won't get a 3rd time out of me. Fool me once, shame one you, Fool me twice, shame on me. We stay at this hotel at least one weekend every month and some months we are here 2 weekends! 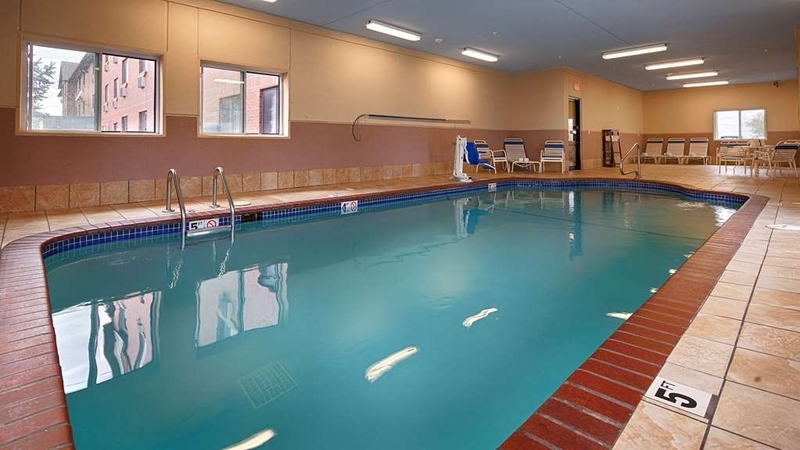 Best Western Plus at the Altoona,Iowa location has excellent staff and accomadations. We are very happy with the quality and value of this hotel!! This is a great hotel and very comfortable. We did encounter two minor problems which were handled by the Assistant Manager to our satisfaction,. It is located next to Adventureland, but we heard not noise from it. I would stay here again. "Yearly Memorial Day weekend with my kids and grandkids"
The location is a plus if you are planning to go to Adventureland Park. The rooms are average size and comfortable for a hotel. The staff are friendly and accommodating for your needs. The pool is quite good sized but was closed when we were there. Breakfast is decent for a hotel breakfast plus the price is included in the price. We had some minor issues that the management were great at comping for those issues. Been staying at this Best Western for about 5 years and will continue to in the future. I arrived later in the evening around 8:30 or 9:00p.m. I had booked online but had to wait quite awhile for someone to come to the desk to check me in. The rooms are a nice size and the bathroom is pretty big. I always check bedding upon arrival and I wasn't impressed. The sheets appeared to be clean but the mattress cover on one bed was soiled and the other one wasn't even all the way on the bed. I slept on top of the two sheets with a towel on the mattress. The TV couldn't pick up a signal but it was too late by then to have someone come and fiddle with it. There was also a tear in the carpeting. All that said, the breakfast hostess was very nice and she worked hard at keeping everything looking nice and appealing. I'm not sure I would recommend this hotel, despite its nice location, until they have revamped their housekeeping and done some needed updates such as carpeting. I expected more from a Best Western PLUS. "Close to the Iowa State Fair"
Very nice hotel. The room was spacious and very clean. The staff were helpful and courteous. The breakfast was great with a very good selection and plenty of food. It is within 10 minutes to the State Fair. Very thankful the hotel held my room for me even tho I arrived very late during the state fair. Honored my discounts and I got the last room for the night. Very good service and friendly staff. If you're passing through for business or leisure I would recommend this Best Western for the night. This was the first time we stayed at a BW. The staff here were so very nice at accomodating for special needs. The room was clean. The hotel is literally right across a small street from Adventureland. You can hike there in 5 minutes. Breakfast is normal continental. Highlight is being able to make your own parfait. We'll def be back next year! Didn't get much pic except of my yogurt with some of the toppings that was available. Nice hotel, great employees. Didn't take advantage of the free cookies or breakfast. Check in was fast and very friendly. Room was clean and comfy. Close to Adventureland and Prairie Meadows, Free Wifi worked great. "Great hotel near the amusement park"
We were happy with this hotel. The price was affordable; the staff was helpful; breakfast was surprisingly adequate; we walked to the park; we had very few issues; we received a discount at Spectators restaurant for mentioning our hotel. "Staff is very helpful and BW has the most comfy beds out of any hotel chain"
James went above and beyond to ensure we enjoyed our stay. We were in town for a slowpitch softball tournament and our first game was at 7:30am. We had to leave Omaha at 4:15am to make game time so we were already tired when we showed up. We won the first game so our next game was at 2pm. We stopped by the hotel around 8:45-9am to see if there was possibly a room available to check in and take a quick nap. James said that they were completely booked the night before and no rooms were available yet but I left my number and he said he would call when a room became available...he figured one would be open around noon. He called me around 11:30am and said that we could check in. We were super grateful for James as we needed that nap...ended the tournament 6-0 and tourney champs. Props to James for making our stay fantastic!! milesej05- Thank you for this great review!!! I will be sure to print this off and show James how he went above and beyond to make your stay great. Congrats on winning the tournament. We will see you again when you are back in town. Have a wonderful day!!!! Robyn Smith- General Manager. There were 4 siblings and spouses gathering for the weekend. The staff was very accommodating, there was an area where we were allowed to gather, and the staff kept us supplied with coffee and cookies. The rooms were nice and comfortable. We liked the location because it was near the sites we wanted to visit. Marilyn B- It was such a pleasure taking care of you and your siblings. Everyone of you were so nice and polite and I enjoyed our conversations in the mornings at breakfast :) Thank you for choosing us and thank you for the kind words. Have a great day!!! Robyn Smith- General Manager. "made our stay the best!" From the beginning we loved how the staff treats their customers. Upon check-in, no wait time because, they already had our keys and paperwork ready. Corey went out of his way to help me that evening when I needed coins for laundry. We stayed for 3 days 2 nights beginning on Friday afternoon. My girls loved the warm temperature pool. Room was the perfect size for my family and beds and pillows, the best we have ever had in a hotel and we've stayed in plenty. Breakfast was really good, from the mini pancakes to the yogurt machine that dispensed fresh yogurt for you! Saturday evening the front desk staff was very accommodating and helped out with a little situation that we encountered and just overall made our stay very pleasant. As if all of that weren't enough; I actually forgot a few items, one of which had sentimental value and they were kind enough to mail it to our home! My husband said that we will be making this our hotel for every Iowa visit that we make! "They go out of their way!" Karla and Robin were extremely helpful with planning a future reservation. 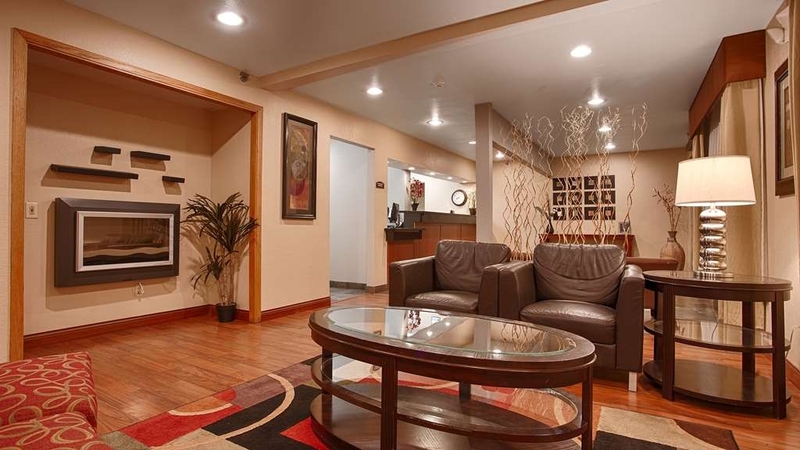 The quality of the service and friendly atmosphere made my stay a comfortable experience. 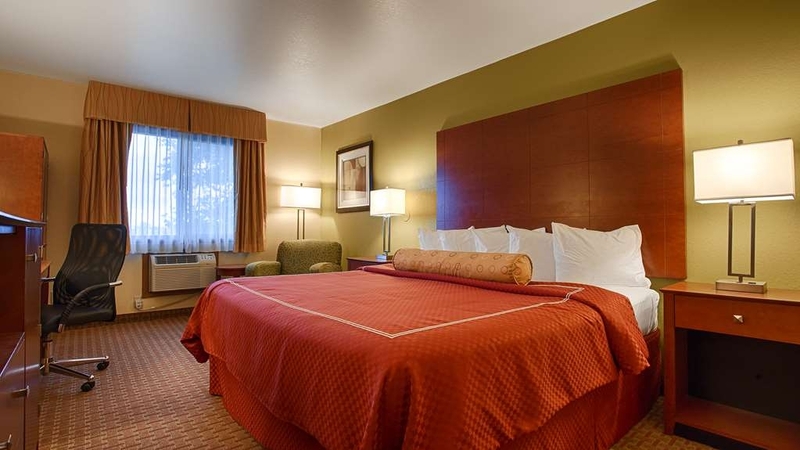 I highly recommend the Best Western for its value at a reasonable cost. Staff was friendly. Room was clean. Breakfast was good. West door was never locked so no key card needed to get in. That should be fixed. Accommodated a large group without much issue. Had a late night and manager was good working with us. "Great place to stay and great value"
We stay here at least 7 times a year for 2 nights. Staff always remembers us and is friendly and efficient. Rooms are clean. We will continue to stay as long as we keep doing business in Des Moines. Sometimes the breakfast pancake machine doesn't work the greatest but not staffs fault. The room was clean, and the staff was very easy to work with. We were in town for a rabbit convention and only planned to stay one night, but with the storms coming in we decided two would be better for clear roads. They worked with us, made sure we had the same room, on first floor. I took two of my kids with, they really enjoyed the pool. It is not a very big pool, if too many guests are there it would get crowed fast, no hot tub. Kids still had fun, you are close to many attractions, and we were only 12 minutes from the State Fair Grounds that the convention was at. We will try to stay here again if the family comes back for summer vacation. Breakfast was good as well. "So So, would look elsewhere"
Booked a suite for family. Room seriously needed some updating and cleaning. Seemed like it was one thing after another. We had a king bed and a sofa sleeper but only had 2 pillows. Called for more but they had none and brought 2 blankets to use instead. Then I realized we had only one towel and they did supply more. The front desk clerk was nice but this hotel lacked the basics one would expect. "Quiet hotel near many attractions"
We stayed one night while in town visiting friends. The hotel staff was pleasant and helpful. We enjoyed the pool area, the water was comfortable and not too cold! The beds were less comfortable than I'd like. Breakfast had a lot of variety, including sausage and eggs. Everything seemed clean and in order. We decided at the last-minute to stop in Altoona, which meant we arrived very late. We didn't pay much attention to anything upon check-in outside of our room. The room was very clean and appeared to be recently remodeled. Since we were only stopping for the night, we really didn't take advantage of the pool or exercise facility, but we did enjoy the breakfast. Although it was the typical "free" breakfast, somehow it seemed a step above the rest. The attendant was very sweet and kept the area spotless, as well as stocked. There were more toppings out for yogurt or oatmeal than I have ever seen at a hotel like this. Instead of the typical waffle maker there was a pancake maker. I'm not sure it is really any better or worse, just sort of nice to see something different. There was also fresh fruit, which was nice. We had a comfortable stay. "corey is the reason we are giving our review"
Sink and bathtub backed up. No one to fix, only thing they could do was move to another room.When left 1 night early, said no refund then said general manager would refund when comes in. So far, no refund. 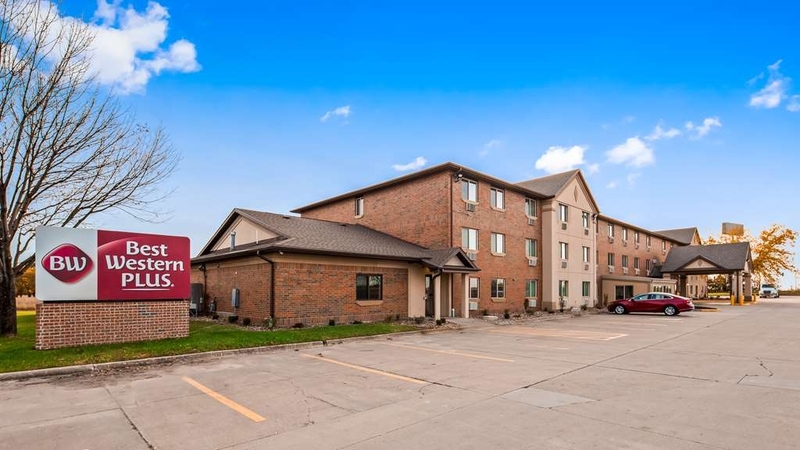 "Great people comfortable and quiet rooms"
"The Best Western Inn in Altoona Iowa is my favorite place to stay when I am in the DesMoines area on business." I have stayed many, many years at this hotel and have an awesome stay. Very friendly staff and willing to help you any way they can. Great morning breakfast (more then just donuts and coffee) and very clean environment. The kind, helpful, accommodating staff are why I continue to return to this hotel for both business and leisure. The hotel is not fancy and is starting to show wear, but is always clean and the staff are great! They automatically take care of my rewards points and remind me of special offers. They go out of their way to ensure my needs are taken care of and my stay is pleasant. Was here on leisure, just to get away. employees all very helpful, plenty selections to choose from at breakfast. Karla at check out was so kind. Also, went down to take a swim before it closed, and it was so clean and nice and warm!! Will stay again!!!!! Lori at the front desk is amazing! She went above and beyond to help us out! Loved that at check in she gave us a list of restaurants to try out. I would highly recommend this hotel it has great rooms and it is a quiet hotel. Very accommodating for your needs. While on a business trip in Altoona Iowa my best idea was to stay at this hotel. It is in an excellent location near everything and a few minutes from Des Moines with even more to try and fit in. For any reason in Altoona this is the place to stay. Clean Place Corey was very helpful. Works nights and was very joyful and made me want to stay here again. It is Central located in the price was good competitive with other places. Don't think you'll have to worry about meth heads around the area. Nice clean motel with friendly staff and lots of parking. Location is close to a lot of food choices. Beds are very comfortable and lots of flow in the showers. Hot coffee in the lobby and cookies in the afternoon. Stopped for the night as we wanted to go to the outlet mall, casino and adventure land. Adventure Land and the casino are just around the corner and the outlet mall less than a mile away. The hotel was clean and comfortable and had the usual Best Western expanded breakfast which was quite good. The people that work there are excellent, caring and accommodating. Bonnie makes sure everyone has what they need for breakfast, you can tell she wants you to be happy. Tish at the front desk, is one of the most knowledgeable, helpful, companionate person I have ever met. They all do great work and want to genially help you. I stayed the week before and left some of my Clothes, Carla let me know they kept them for me knowing I would be back. Best treatment you could ever imagine great people. Super place, nice and quiet. Lots of food options within a mile. Great rooms. Super helpful and friendly staff. Second stay for me. The breakfast is always hot and delicious. I will stay again anytime I am in the area. The heater was set at 67 when we arrived and it was hot in room. Set it at 65 and later to 62 and the heater kept coming on throughout the night at random. I finally turned it off. I mentioned this at checkout, and he said that a possible broken thermostat. The agent did not make any notes, so it seemed like it may not get fixed. Corey is awesome. He helps me out so much when I come to town and stay at the Best Western for work. I always know I can count on him to take care of my room. Any problems with my stay, and he makes sure that it gets taken care of. The employees at this hotel are very friendly and helpful! Karla is full of energy at the front desk Bonnie is one of the kindest people you will meet anywhere and she does a great job with the breakfast area! The hotel is very clean. The rooms are a bit small and the property is a somewhat dated, but plenty big for us, and it serves our needs. Plus, the people who work here make this a must-stay for us when we are passing through on I-80. Also, conveniently located near amusement park and casino. The guest speaker stayed in the motel for three nights with much pleasure and there was excellent distance from the motel to the centre to drive around. My pleasure to stay, relax and watch the final baseball playoff on TV quietly! I have used this hotel as a base for business travel. It is convenient and has a number of attractions in the area. I have also extended my stay over a weekend to include the racetrack and Amana Colonies. This hotel has a shuttle to Prairie Meadows that is nice if you just don't want to drive somewhere for dinner or a little entertainment. As always, my recent experience at Best Western in Altoona was top-notch. Service was excellent and staff was very friendly and helpful. A special shout-out to Carla for her welcoming presence. Rooms are clean and rates are a bargain. Stayed at this hotel 3 times before. Made this our half way stop destination. Room this time was very hot when we opened the door, outside temp was in high 60's. AC did not work well enough to make the room comfortable. Made comment to desk clerk when we left to get dinner that the room was very hot. Desk clerk did not acknowledge my comment. Granddaughter next morning after we checked our early in AM and our way to our destination complained of itchy bite marks on her face and arms. She did not have these when we arrived at this hotel. Neither my husband nor I had any marks. Possible problem at this hotel?? "Pretty good room, put your "Do Not Disturb" out the night before"
Everything very good except on our last day housekeeping came before 0800 to try and clean the room. Put your "Do Not Disturb" sign in the room key slot the night before. Hey, we were on vacation and get up later after a full day, come on...0800, checkout isn't until 1100. "Converted from a cheap place to a cheap Best Western"
By the time taxes were added this place cost me over a hundred bucks. I could have gotten a better room at a motel 6 for a lot less money. The room was small, very small. Two people could not walk past each other. The only closet was a homemade thing of wood that could be moved around. The room we were in had been a smoking room when the joint was a "Heartland Motel and you could tell it. The beds were comfortable and the bathroom was okay. Thank goodness the ladies who worked there were great and could not do enough to help. The breakfast was good. I would go back there for the people but I could not force myself to stay in the crummy place again. This place butchers the Best Western trade mark. The sleep quality was marked down because of the smell. Great location. Easy to get to. Friendly staff. Good breakfast. Just a nice place to stay. Liked the fitness center comfortable not to hot. Nice pool area for families. Check in and check out was made pleasant and easy. The free cookies after 5:00 is a nice perk. janete861- Thank you for writing your review. We love hearing our guests are satisfied and enjoyed their stay with us. The cookies are always a PLUS. We look forward to seeing you again when you are in the area. Have a wonderful day!!!!! Robyn Smith- General Manager. "good motel - excellent manager"
The motel was clean and well kept, but Corey the motel manager is why we're paying this compliment. We came into the motel tired and grumpy. Corey was upbeat and very helpful. He had the perfect attitude for us weary travelers. Nice job Corey - you gave us a good reminder that a positive attitude makes a difference. "A nice very well-run property, (but it needs an update)." I enjoyed my experience here, and would stay again. The room was large and clean, tastefully decorated. The breakfast experience was acceptable. The staff was friendly and courteous. I recommend this hotel. I will note, however, that the property is showing its age. The exterior could certainly stand a refresh, and the inside takes me back to the Clinton administration. I did notice, however, that construction is underway to expand the breakfast seating area. Overall the stay was good. Breakfast was the only problem. Most staff was pleasant. Breakfast staff was a little snippy when I spoke to her. Heard her tell many people when they asked for something that we close at 9. Not an answer to their request. I know she was flustered, maybe she needed help. "Certainly not BWPlus designation. Facility was not maintained inside. Cigarette butts all over grounds. Carpet ripped"
Facility not maintained. Telephone did not work. Carpet ripped. Dingy interior. Cigarette butts all around hotel. Staff indifferent to guests. Would never stay there again! Worst BW plus facility we have used. dgigliotti- Thank you for taking time to write a review. We do appreciate all feedback from guests. We want all of our guests to have a great stay and I do apologize we didn't meet your expectations. We would like to earn your business back. I would like to discuss this with you further, please contact me at the hotel directly. Thank you and have a wonderful day!!!! Robyn Smith- General Manager. This is the first time that I have stayed at a Best Western in quite some time. I am very surprised at the quality of the room, the rate and the staff of this hotel. I highly recommend this location if you are in Altoona. You will not go wrong. "Dirty Wet Floor + Marginal Breakfast + Other Problems = Bad Stay"
We stayed at this hotel for two days. It was not worth the money. The floor was wet for some reason, so we had to wear socks. The socks got dirty. The room was small. The toilet was placed too close to the sink and would cut into your shoulder. Very poor design. The breakfast was no where as good as other BWs we have stayed at. More like a Best Western Minus. We would not recommend this to anyone. This hotel is very clean and has a friendly staff! It is nicely located near many places of entertainment! Adventureland, Bass Pro Shops, and Prairie Meadows Casino & Race Track. Nice complimentary breakfast too! Very good value for the price! Hotel was decent, staff was extremely nice. Wifi internet connection was a bit slow, but that's ok. Free shuttle to Prairie Meadows was great! Only bad thing was there were lots of kids running up and down the hallway at 7am - 9am. Luckily it was on the day we had to get up and go home. 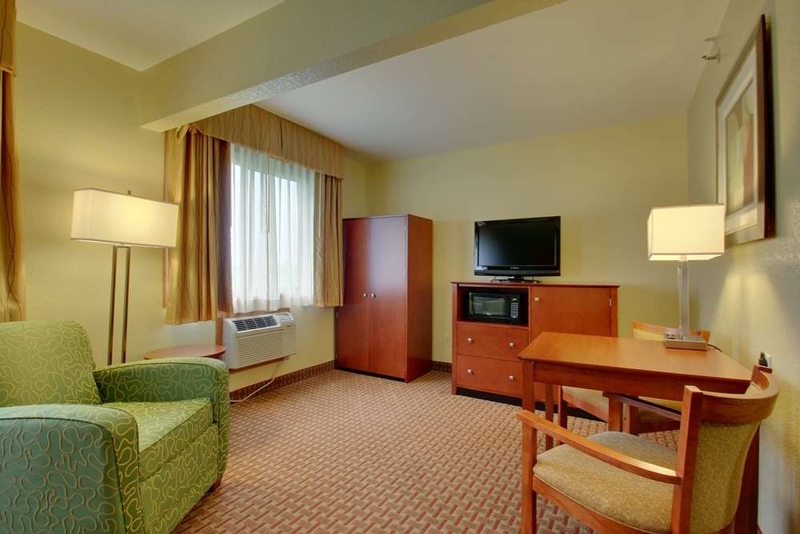 "Convenient to local attractions including the Iowa State Fair"
We were upgraded to a Jr. Suite which accommodated 3 people wonderfully. The staff was very pleasant and helpful. The room was clean albeit the bathroom rather small and in need of upgrading. Hotel coffee was highly rated by guests. Great value for the price. We attended the Iowa State Fair for several days. This is our place of choice for the 3 nights we stay. Always clean, quiet. Great breakfast, lots of variety. Nice gals hosting the breakfast time. From the moment we walked in everyone was extremely friendly. The check in and check out was very quick. The hotel is very clean and well decorated. The staff waa always smiling and ready and willing to help with anything. The breakfast was delicious probably the best hotel breakfasf we have ever had. We will defiantly be staying again in the future. "Great service but terrible quality of sleep"
Check-in process was great. The front desk staff is very helpful and knowledgeable. We booked a a room with two queen beds but were moved to a two queen handicapped room because they were sold out - which is fine. The room itself was clean spacious. The only issue we encountered is the fact that we have not gotten any sleep for multiple reasons. One, we are right next to the stairs and can here every single person go up and down. Two, the AC unit is terribly loud with sounds of running water. I turned it off several hours ago. Three, we can hear the tv from the room next door. Now I'm awake due to some strange noise that has been buzzing for an hour or so. Hopefully my toddler won't be woken up again. Hotel was nice, room was comfortable, almost all of the staff was nice. Couple of front desk ladies were rude. My family and I stay here just last year. We hard a great experience. This time my girls got sick because of the chlorine levels in the pool. Everything was taken care of, but no apologizes for what happened. Have we becoming less caring as a society? This was a fine stay in a hotel, the rooms were on the small side but were clean and comfortable. The pool was a little bit bigger than some of the newer hotels we've stayed at. Breakfast was very typical - there was a pancake maker the kids were super excited to try out but no one seemed to be able to make it work for more than one person at a time (including the hotel staff). It is right next door to Adventureland and there are other shopping and restaurants close by that make the location convenient. This hotel was way overpriced for accommodations. Rooms are small, musty and dated. Pool was small, breakfast was mediocre at best. This was probably the worst stay I've had in a very long time. Yes, you are paying for location, but seriously need to reinvest into the property. Won't stay again! Pro's: staff were great, rooms were clean Con's: room was so humid the bed sheets were damp, very uncomfortable...tv remote worked inconsistently...breakfast was average at best Overall: The price is not low enough to expect the quality of room we got. We cranked down the A.C. to try to cut the humidity out, so then it was unbearably cold but at least we were then able to sleep. I would have been ok with this room if it had been less than $100 a night. I would not recommend unless you can get a better discount than I paid. "Good value, clean, right by Adventureland"
Directly across the street from Adventureland! Great breakfast! Not luxurious, but for a family day trip it was prefect and economical. I would recommend this hotel for a family that has a full day planned and needs a quite and clean place to fall asleep. Plus there was hot water for all 4 of us in the morning. "Clean, comfortable and walkable to Adventureland"
Our family stayed there one night to accommodate a two day trip to Adventureland. We parked the car, checked-in, and walked over the park both days. 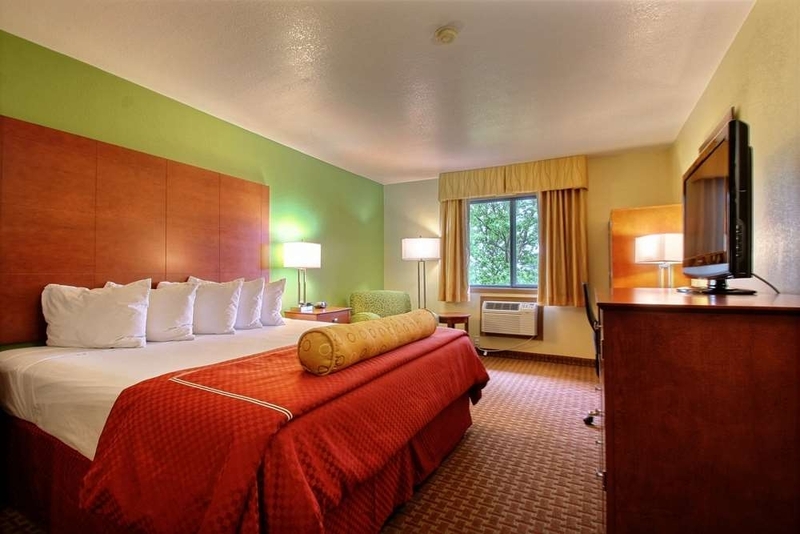 The hotel was clean and comfortable and reasonably priced. We didn't spend a l lot of time there as we were in the park all day for two days. Breakfast was OK. When we go back to Adventureland, we will likely stay here again. "WORST EXPERIENCE ON A 10 DAY TRIP"
This place is very dirty and old in appearance. Terrible odor in room and furniture is visibly dirty. Wear a HazMat suit if you are planning on staying here. It is located across from a large amusement park, bring in the guests despite te quality of product. "Right across the street from Adventureland. Average accommodations." We arrived here hours before check in and they allowed us to park there while going to Adventurland. Saved us some money on parking and it was right across the street. I feel the hotel was just average. Nothing outstanding about it and nothing bad to say. Very clean rooms and bathroom. Comfortable bed. A/C seemed like it was not working at full potential at times throughout the night but not enough to complain about. We liked how close it was to Adventureland. I think the price was a little high for this hotel as it was nothing special and we have stayed in much nicer for less. We think it just there are not a lot of hotels around this area so they can charge a higher rate. Chances are we will not likely be in the area again but if we happen to we would stay again. We stayed here for one night on a cross country road trip. It was easy to get to from the highway. The staff was very friendly and helpful and had restaurant recommendations at the ready. The room was a bit under par from what we usually find at Best Western hotels. The major issues were a musty smell and both the room door and the bathroom door both stuck. Perhaps a dehumidifier is in order. The staff helped make up for an underwhelming room. This hotel was in excess of $100.00 and we were willing to pay more to get the Best Western Plus than some of the other local competitors. Big mistake. The room had a funny odor to it and the second family with us complained of their room feeling damp. Even the bedding felt damp. As I went to get into bed after our late arrival a spider crawled down the side of the mattress. Needless to say the nights sleep was then shot. Also the breakfast area closed at 9AM. There was probably a minimum of 15 people there eating and more streaming in when an announcement was made that the area was closing in 5 minutes and trash cans were pulled across the opening so no more could come in. Pretty sad, a lot of little disappointed faces.... Would definitely NOT stay again! The room was very clean with no odors. The continental breakfast was average. The Hallway had a slight odor but not terrible. Close to fairgrounds and next to water park. Staff was very friendly and accommodating. "Needs update. Kinda grungy. " I wouldn't stay here for a vacation. This was a work hotel trip so I tolerated it. 90% certain my bed sheets weren't clean considering there was a booger wiped on the edge of the sheets that I didn't see until the next morning. I couldn't use the desk chair due to the fact the back was missing. If you are staying in the Altoona area there are plenty of other good options. "Enjoyable and relaxing vacation stay." Staff was helpful and gave us excellent service. The location was perfect for our stay and visit to Adventureland park and bay. I would recommend this BW to my friends and relatives. The children in our family enjoyed the pool and hours. We were looking for a hotel pretty close to the fairgrounds for an event we were attending, but didn't want to stay there. Neighboring Altoona suited our needs. Right off I80 and less than 5 miles to the state fairgrounds. Arrived ahead of check in and was still able to go to our room. Friendly staff. Clean room. Good bed and pillows! It felt a little damp in our room, ground floor, especially after the heavy downpour that we experienced. Will stay here again. Tis Best western is very clean. The linen smelled very fresh. The service at check in and out was very friendly and helpful in the surrounding area. Breakfast was good and the overall experience was a great quality for the price. I would highly recommend it. 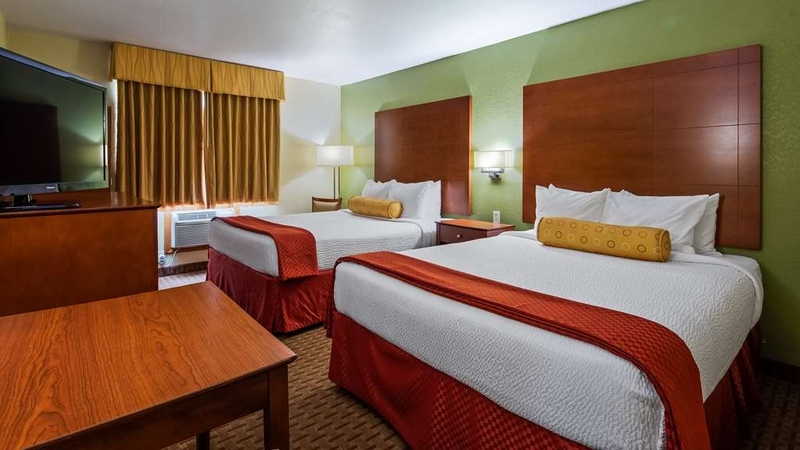 "family stayed during pork expo"
This is a easy short drive from the Iowa State Fairgrounds and has many different restaurants and a walmart near by. It is also right across from Adventureland; which means you don't have to drive there and pay for parking! The employees were very helpful and friendly. There were 4 little kids and 2 adults in the room and it was pretty cramped and there wasn't alot of counter space in the bathroom. My personal preference would be to have a closet by the door to put shoes and stuff in and out of the way; They have a little movable closet thing way in a corner by the window. The breakfast was good but the dining room area is very small! The pool was kinda dirty and there isn't a hot tub; which was a bummer. "Quality stay for the value"
Friendly staff and quality experience for the value. Carla always delivers top notch service at check-in and throughout your stay. Convenience and location is great. Close to entertainment and many good restaurants. Stayed here for two weeks and the hospitality of the day & night staff are outstanding! A smile, a small conversation and of course evening cookies goes a long way to us business travelers. I would highly recommend staying here because of the staff. Thanks guys, I'll see you again! 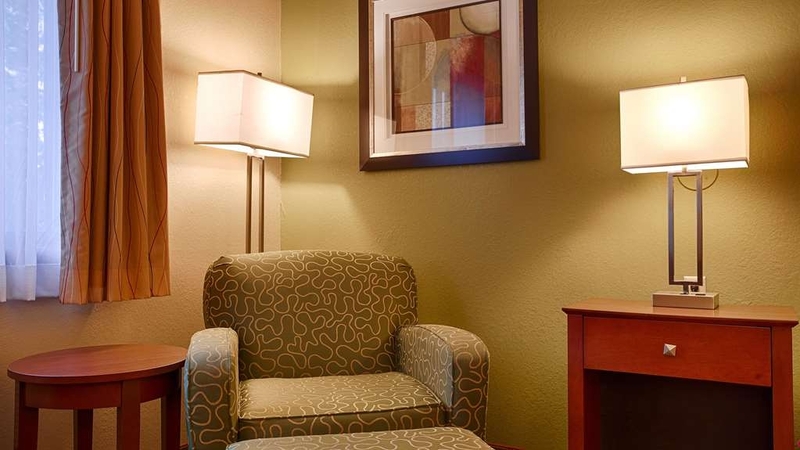 "My Favorite- Staff makes this feel like home"
Best Western Plus Altoona Inn, Altoona, IA is my favorite hotel mostly because of the friendly staff that are willing to do anything to make my trip a success and my stay comfortable. That attitude permeates all levels from check in, to breakfast, to midnight staff, to check out, everyone is awesome here. I stayed at the BWP Altoona Inn one night as I was in the area for a conference. I would describe it as a typical Best Western. It had a nice workout room and an indoor pool which looked nice although I did not use it. The continental breakfast was like every other. The staff were all friendly and professional. The room itself was clean and spacious. I happened to get a handicap friendly room, which seems to happen frequently for me although I am not handicapped? Anyway the bed was quite comfortable and the TV and wireless worked great. My one complaint was that there was some kind of rattling noise coming from an interior wall. It was intermittent and quite loud. I was very close to asking for a different room but I was already unpacked and settled in so I toughed it out. I brought it up to the front desk and they seemed very interested in fixing the issue. I would stay again, but probably not in room 126. Stopped in for the night while traveling in business. Great staff. Really friendly. Room was clean. Bed was comfy. A little dated, but did the trick. Close to some good restaurants and grocery store too. I'd stay again. Excellent staff & accommodations! Traveling with 17 teens for youth conference is always fun & can be a little crazy when the pool is out of commission. The staff did an excellent job of keeping us apprised of the situation & compensating us when we were unable to use it. They even gave the students fresh baked cookies & popcorn! Despite not being able to use the pool, one of the main reasons I booked rooms there, we'd definitely stay there again! "Quiet, comfortable beds, clean rooms"
I stay at alot of motels, this has been right up there with the best. I slept for almost 2 days after hard week of travel. Hotel check in was easy and great. One thing that I know is the motel cleaning staff across America doesn't get enough appreciation, they can make your room a bad experience or a great one! My room was awesome. Thanks to the desk and cleaning crew! Carla got us to stay here 6 years ago.In our business we've probably got 15 or so other businessman to stay in Altoona Best Western also.Main reasons I would say are friendly people, clean rooms, great breakfast, If there is a problem its usually handled proffessionly & quickly. Not like the current Dr. being drug off of an aircraft after he was already seated! Very good value. Staff really know how to take care of guest. I was upgraded as a surprise and it was. I stay on the road over 100 nights per year and this is one of the best I stay. Convenient to use and several great meals choices close along with a casino for those that like that sort of thing. I frequent this hotel do to the amazing service I receive! whenever I go I always seem to come in contact with a women named Mary whom works in the evenings/nights! She always has a smile, remembers who I am, and never hesitates to go out of her way to help! I always feel welcomed as it is my home away from home!! "Not bad,could use an update in ares." We had a 1 king bed(suite?) that could sleep 4 people.It had a sitting area that had a pullout sofa and was suppose to have a chair too but i had to ask the front desk for the chair,for some reason.I have to give credit to the front desk person,She was nice and delivered the chair quickly. (Staff was great) The room itself is ok,it needs to be updated especially in the bathroom. The tile in the shower had a few large gaps in the grout and under the faucet.The toilet kept making noises every 2mins until i took the lid off and fixed it myself.The vent fan is pretty loud and vibrates way too much.Very bad lighting too.Also the A/C unit has a broken vent. (room 101) The bed was comfortable but we didn't like the pillows at all. Overall the room was decent for $101 plus tax.We will stay again but we hope they do some work on it soon. It is across the street from the big amusement park Adventureland,So be warned it will be busy when that is open. NOTE:The rear entrance doors do not lock,anyone can walk in at anytime.,no key needed.Kind of a safety issue. To start with, I apologize for not getting the lovely woman's name who helped check us in the afternoon of March 6th. I'm not sure I've ever had better service. The rate we received was better than the online one available on many sites so I suggest checking with the hotel before booking with any of them. We made our usual requests, top floor, quiet, etc and were accommodated. We were asked if there was anything she could help us with in terms of the area and offered us a restaurant list. I perked up at the listing for Cool Basil since I only get Thai cuisine when I travel. I was told it was very good and we were given specific directions. That review will follow. The hotel itself was adequate in all respects. We found the beds a little hard (personal preference) and the vanity a little small if you have lots of "vanity stuff" and, like many of the older hotels - not enough outlets for gadgets. But it was quiet and clean and that carries the most weight. Breakfast was...meh but again, an expected standard. Lots of shopping and dining close by. Robyn, Karla and all the others provided top notch customer service! Great staff, comfortable rooms and excellent location! Visiting with other patrons you can see that everyone there was highly satisfied. "On the road again "
Clean rooms. Great off season. Indoor pool for Grandchildren. Near Amusement Park if you want activity during busy season. Nice staff Restaurants and shopping near by. Older Motel but well kept up. Good beds. Slept well in a quiet room. "Older small hotel, however the employees made it Very Good!" Not sure why this Best Western has a "Plus" designation? Unless it is for the great employees? The building is old and very small. Beds were OK. Bathroom was newer and clean. Provided popcorn and fresh-made cookies to guests - although they were out of the cookies one night we were staying. The front desk employees were very helpful, and the attendant at the free breakfast was excellent. Busiest employee at the hotel. The breakfast area is very small for the # of guests when the hotel is sold out like the nights we stayed. She did a great job of taking care of the breakfast area!! The usual breakfast choices. Good value for good location just NE of Des Moines, East of Ankeny and South of Ames. Adjacent to Adventureland. I had been traveling and needed a place to stay overnight. 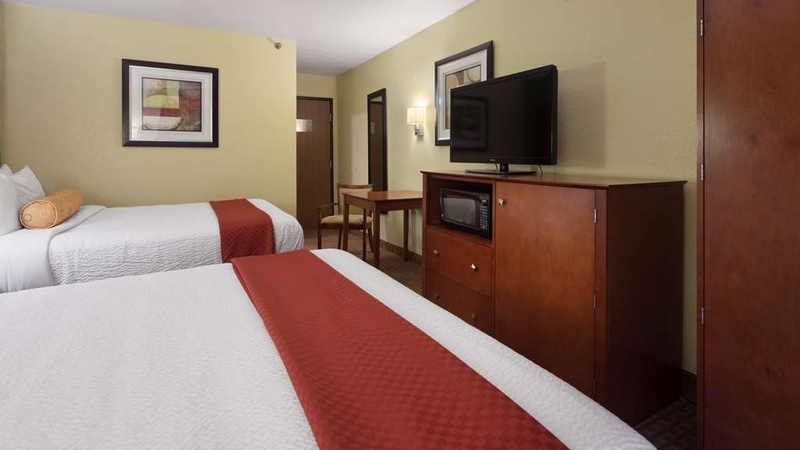 I called Best Western Plus in Altoona, IA to make a reservation. Mary was extremely helpful over the phone and had everything arranged before my arrival. She made a tired traveler able to get to room quickly so I could relax without having to go through re-check in after arrival. Thank you Mary and Best Western in Altoona, IA. I will stay at your hotel next time I pass through the area. "Dark and smell like mildew"
This is a very old hotel that was given a face lift on the outside and lobby but the rooms are disgusting. The room was very dark and dreary and extremely small. The worst part was the smell of mildew in the room. Thank goodness the room was so dark because I would probably be afraid to see what I was actually sleeping in. Worth the drive to go a little farther to avoid this palce. I would recommend this motel to anyone. it is clean, quiet and has a very friendly staff. The breakfast is good. If you need a restaurant recommendation, the front desk clerk is always very helpful. I travel for my job periodically and this is the motel I prefer to stay at. Try it, I'm sure you will like it. I had to check in with little notice. Mary helped me get checked in fast and smiled while she did it. The room was better then i expected for the reasonable price. Very satisfied with my stay. I wish every hotel staff was this friendly. I've had bad experiences at other hotels. Thank you Best Western and Mary for the excellent service. The lobby area was clean and neat. When I got off of the elevator on the third floor it looked to be clean but the moldy mildew odor about knocked me over( when we stayed last year this was also a problem but not as bad). When I went into the room the same odor but not as strong. I went to the lobby to speak with the desk clerk about this. She got out the deodorizer and went up to the third floor and sprayed the hallway and our room. It didn't really help much. Last year they said that the air conditioners needed cleaned. This year they were blaming it on the carpets being cleaned. Surely if those carpets were clean they wouldn't have smelled so bad. There was also mold in the bathroom around the tub.We have stayed there before the last two years and didn't have this problem but we won't be staying there again. We happened upon this hotel last year on our trip to Colorado. We made it our half way stop there and back this year. The staff is very courteous and attentive. Clerk behind desk in lobby had many answers to our questions. A list of local attractions was provided as well as restaurants. Near by was an Amusement park that was closed for the season. Amazing staff and facility! Super Clean and well-ran everything! The breakfast theybserve is wonderful with many options. The wifi wotks great. All the staff are really nice too! I would totally recommend this hotel to a friend! Nice quality hotel for the price paid. We were looking for a hotel close to out venue. This one fit the bill. Check in was easy. Clerk was very pleasant to work with, even though it was 10 at night and there was a line to check in. Rooms were nice and clean. The bed was extremely comfortable. Didn't try the breakfast. Overall very pleasant stay. Would stay here again next year. Priceline messed up our reservation at another hotel so we called over here at about 1:30am looking for a room and Will quickly got everything lined up for us. Solid room, great rate and very helpful staff. emont88- Thank you for writing a review. I'm sorry about all the mix up you had to deal with. I am pleased that Will was able to get you in a room and you were satisfied. I will be sure to let him know how helpful he was. Thank you and have a great day!!!!! Mary at the friend desk was very polite and even helped find a good place to eat. She always said hi when we would walk by. The rooms were clean and comfortable. The whole hotel seemed to be well kept. I will definitely stay again. My family always stays at this hotel when we go to Adventureland because you just can't beat what it offers. 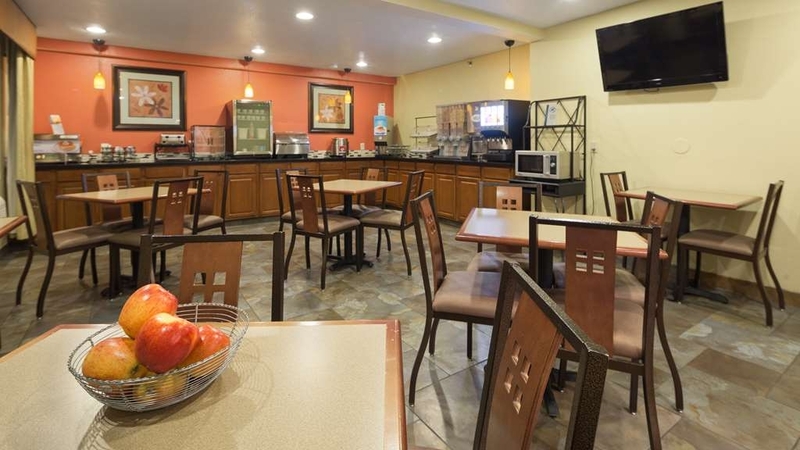 Great location, clean rooms, good breakfast with both hot and cold options. The problem was the wall unit smelled like mildew. Fortunately we were able to open the windows and it was cool the night we stayed. If not for that issue, we would highly recommend this hotel. 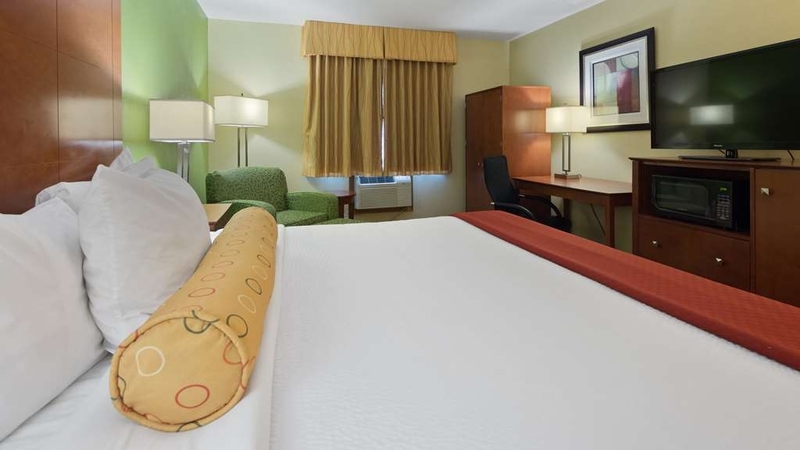 We stayed at Altoona Best Western while attending an event at the Des Moines fairgrounds. It is a convenient location. The staff is very friendly. However the rooms are small. The rooms are beginning to look old and suffering from wear. All that being said, I would stay there again due to convenient location. My family and I were passing through, We didn't realize there was an amusement park right next door, didn't bother us, be expect traffic and noise from the park. There were other erie sounds around the hotel, to find out there they cicadas (not something we have in our hometown). However, the room itself smelled bad! The beds were clean, the floor was clean, but the room itself had a horrible smell and we had to laundry the next day to get rid of the odor from our clothes. The pool wasn't great either. It smelled and left a salty residue on our skin. We were concerned about our vehicle and was told they have cameras on location and do walk the premises at night. "Cancelled our RSVP upon arrival"
We were traveling through the area and needed a place to stop for the evening. The Best Western was nice and quiet. Rooms were clean and the beds were comfortable. They offered breakfast in the morning that had quite a few choices. Nice way to start the morning before heading out on the road again. "Great stay across the street from Adventureland"
We arrived an hour before checkin actually started (3pm) so our room wasn't ready yet. They had had a few cancellations and a king room had opened up, so they upgraded us at no additional cost. And our room was ready within 15 minutes. The room was clean and comfortable. There was a varied breakfast with hot and cold items. Staff was friendly and helpful. The vending machine ate my money and wouldn't give me a bottle of anything and another vending machine returned my money but shorted me a quarter. The gal at the front desk reimbursed me for all of it plus gave me a bottle of water at no cost. They go out of their way to satisfy their customers. Rates were high because of the State Fair, but every place in town was the same way. Room was comfortable, breakfast adequate, staff very friendly and most helpful. Hotel shows wear and could use some updates, especially in the bathroom. Close to major highways and easy drive into Des Moines. Had issues with key card, twice, and TV remote didn't work, though staff were quick to resolve. We stayed at this hotel again on August 10 and 11 2016. This hotel is a great place to stay! Staff are all great, rooms are great! Everything was great! The lady that checked us in was very helpful! Her name is Karla. Our daughter and granddaughter enjoyed the pool, the cookies and popcorn! We will stay at this hotel every time we go to Altoona. I would recommend this hotel to everyone! This hotel is close to Adventureland, but we stayed this time to go to the Iowa State Fair! Picked this place from reviews online. Walked in and stood around while employees restocked the coffee station. There was caution tape and a strong smell of cleaner that took over the lobby. Once in our room, it was ok. Nothing fancy. About 5-10 minutes after being in the room we received a knock on our door and an employee (well I think she was an employee, she didn't have anything identifying herself as an employee) was at our door with what appeared to be a can of bug spray. After I opened the door she seemed surprised that someone was in the room and then just said sorry and left. After that, we didn't want to stay there anymore and left. "Our room was a bit on the smelly side..."
While this hotel has been recently renovated, we found our room had a rank musty smell. It wasn't all that bad when we first arrived, and we were on our way out to dinner anyway, starving after a long day of driving (2500 miles this road trip). But the smell got worse after each of us showered, as if the moisture from the steam stirred something up. We had heard the staff tell another customer at the counter that the hotel was full that night, so we didn't bother to ask to switch rooms. We were put into the Handicap Accessible room directly adjacent to the pool and laundry room, a good sign that we got the last room since we didn't request it. This room was also adjacent to a stairwell, which was quite noisy at night. Nothing we could do, so we stuck it out until morning. But my husband absolutely could not wait to get out of that room in the morning. I thought the hotel wasn't perfectly clean (the foyer was covered in dust, and when you looked closely in the corners of the bathroom, its age was showing despite the renovation with discolored grout in the floortiles, etc). But it seemed clean enough that I didn't want to give it 2 stars. But I couldn't in good conscience give it more than 3 stars. Oh, and I agree with other reviewers, parking is far too tight for the number of rooms. We were lucky to find a spot after we came back from dinner. We really enjoyed the motel and would stay there again. Both of the BW Plus hotels we have stayed at on our 3-week road trip were the best places we have stayed. Nice room and a great location. Many good restaurants nearby. The Adventure Park is across the road, so there are a lot of families in the summer, but this wasn't a problem. 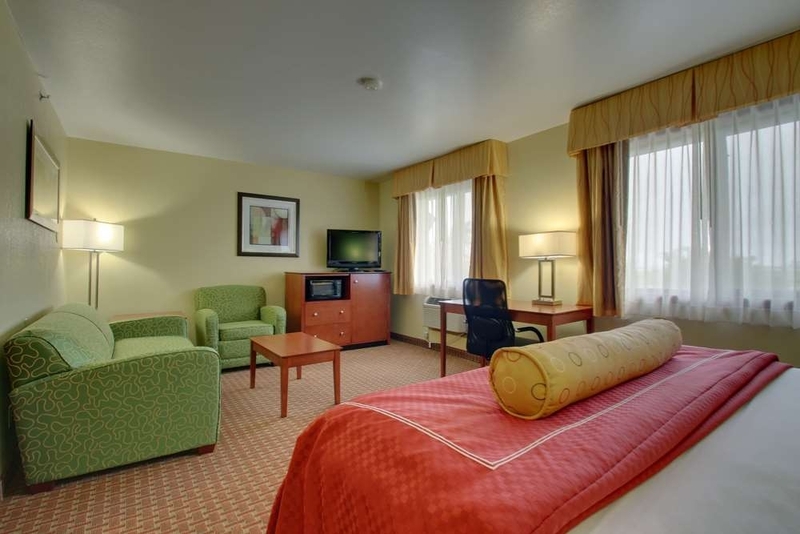 Large and comfortable room and great staff. This place is right across the street from Adventureland--super convienient--and walking distance if you want to avoid the $10 parking free. The place was clean. It wasn't fancy, but comfy, and a great place to crash after an exhausting day at Adventureland/Adventure Bay. Though we did not use the pool, it looked nice enough. Breakfast was very good--eggs, sausage, biscuits and gravy, pancakes, cereals, fruit, yourt, bagels, muffins. My picky kids were both able to find something they liked. I would stay here again for sure the next time I come to Adventureland. Very nice motel, right across the street from Adventureland. Entrance to amusement park is less than a 5 minute walk from motel. Avoid the $10 parking fee at the amusement park and stay at the motel. Breakfast bar is great for folks not wanting to drive down the road for a fast food breakfast. Friendly and polite staff. Staff was excellent, very friendly, and very accommodating! The beds were super comfortable. Absolutely loved the shuttle service to the casino. Take advantage of that service. The only downfall was the entrance to Adventureland crossing over that very busy road from the hotel. It would be nice to have a stop sign or signs or just a pedestrian flashing light as there was an accident when we were there. Otherwise, great stay. Thank you! Stayed in a block of rooms reserved for a family wedding. Lobby area isn't real welcoming. Entered the room it smelled like a stinky deodorizer, air felt wet or humid. Rooms dark and drab. Frig included. Slept good. Breakfast pretty average, hot and cold foods. Probably will look elsewhere next time. "Great hotel close to the interstate and lots of attractions!" My boyfriend selected this hotel for us to stay in as we were attending an event that was being held close to here. We have stayed in Best Westerns previously when we traveled and this was definitely one of the nicer ones we have stayed in. The location is ideal as it is right off of Interstate 80 and for families or those going to Adventureland, it is literally right across the street from the backside of the theme park. So you are able to park here and then walk right over to the park, which is handy as then you are not having to pay the $15 to park at Adventureland. 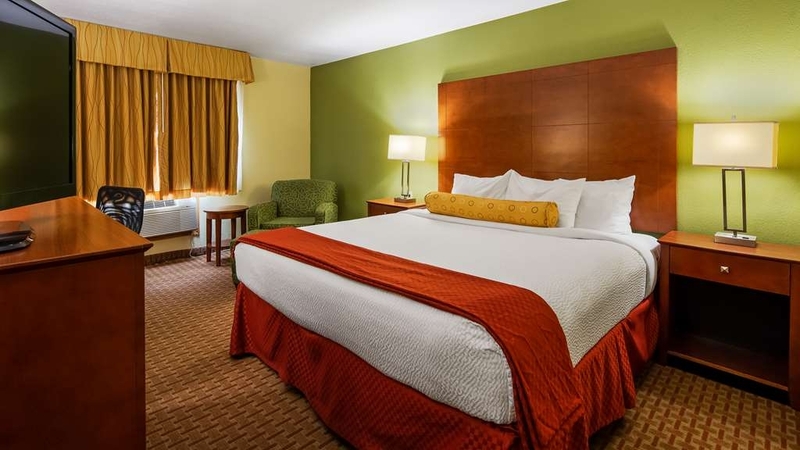 This hotel is also within just two miles of Prairie Meadows Race Track and Casino, which while they do have their own hotel, this hotel is a less expensive option to consider. 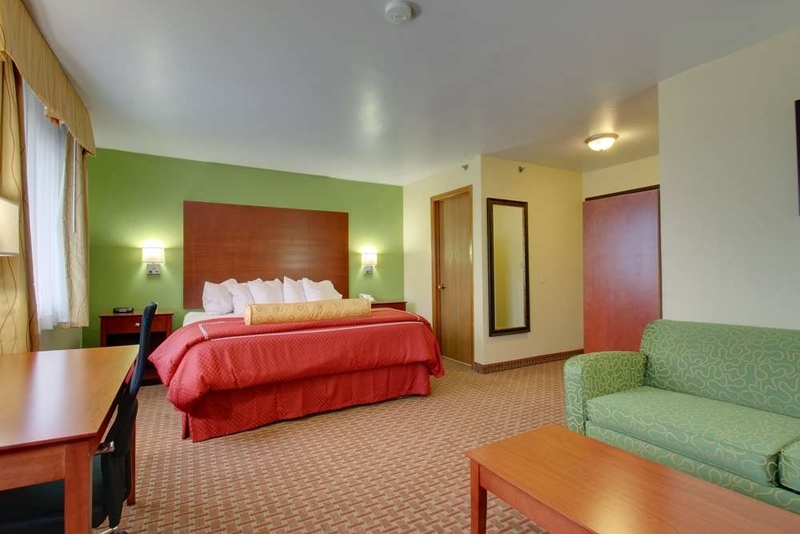 Finally this Best Western is also not too far (about a 10-15 min drive down Interstate 80) from the Newton Speedway. This is great both for the fans and crew members. There were actually quite a few people staying here that were both fans and crew members, as there were races going on the weekend that we stayed. While the hotel was obviously full of families due to its proximity to Adventureland, it was not noisy at all. We literally only heard some kids just once in the hallway and it was earlier in the evening. That being said though the room that we were in, Room 233, which is on floor 2 of three floors in the hotel, had a very creaky ceiling! What I mean by that is literally every time some one was walking around on the floor above us, in the room that was directly above ours, there was a very annoying creaking noise and it just happened to be right above our bed too. So perhaps that is something that their maintenance needs to check into. Other than that there was no noise from the hallway and thankfully our room was at the end of the hallway. One other odd thing that we did notice was that on the second floor where our room was, when you get off the elevator there is a sign directing you to the various room numbers. However according to the sign the rooms ended at 232, yet we were in room 233. So they may want to add that to the sign or someone might get confused The room itself was very tastefully decorated, the room temperature was easily adjustable, the bed was wonderfully comfortable, there were an ample amount of pillows that were just right, not too soft and not too firm. The blankets were great. There was a small in-room coffee maker, microwave and fridge that we did not use, but that would come in handy if you were bringing back leftovers. There was a very nice flat screen television, and closet too. The bathroom was decent sized and they had nice toiletries too. We did not get a chance to check out the pool, but when I peeked in at it, it looked decent. Their breakfast buffet was very nice, they had pancakes (a nice departure from the usual hotel breakfast buffet fare of waffles), really goods sausage links, scrambled eggs, various flavors of mini muffins, bread for toast (including cinnamon), English muffins, bagels, various types of dry cereal, oatmeal, yogurt, milk, juice and coffee. Everything was kept very well stocked, the area was nice and clean with ample seating and Bonnie the breakfast hostess was very sweet and did a great job keeping up with how busy it was. Their breakfast runs until 9am during the week and until 10am on Saturdays (when we were there). Check in and check out were both a breeze and everyone there from the front desk staff to the housekeepers were very friendly. Overall we really enjoyed our one night here and felt like we really got our money's worth. We would recommend this hotel and look forward to staying here at some point in the future. "Warm Hospitality on a Cold Snowy Day"
We traveled here over the Christmas/New Years holidays and were caught in an unexpected ice/snow storm. We decided to stay an extra day in Altoona and wait for the storm to blow over. The staff was very welcoming, they had warm chocolate chip cookies at the desk, and were able to book a second night for us. We were more or less stuck in our room for a day, but it was comfortable and we spent most of the day reading. The room was spacious and all of the furnishings were comfortable. The internet worked great and there's a fantastic BBQ joint across the street (featured on the TV show "Man vs Food"). Their offseason rates are reasonable and we liked our stay so much that we signed up for Best Western Rewards, and it remains our first choice for a reasonably-priced, comfortable accommodation. I was lost and traveling with two young children and unable to find the hotel. I drove around for about an hour until I gave up and called the hotel front desk clerk. She proceeded to give directions and I told her I completely turned around on my directions. She stayed on the phone with me until I reached the hotel. I cannot tell you how relieved I was she talked me through to my destination. Amazing service!! Mary was great!! Good room, kept same room each week, for 3.5 weeks(thanks to Mary!!) with checkin on Monday and checkout on Fridays...made it more like "home". Good breakfast and nice weight room, didn't use the pool but looked average or above. Clean room and same as how I left it, minus bed made and supplies restocked!! Overall, I would return next time I come to Des Moines area!! "Service staff was excellent. Mary went out of her way to make sure our stay was fun." Mary was extra nice to us and was so friendly. She made sure we had fresh popcorn and cookies. We played games and cards in the breakfast room and she was so nice to check with us to see if we needed anything. "Last minute decision to stay in a hotel"
You know when you are in limbo on whether to stay at a hotel or travel home? Well, the time of evening when I finished eating supper withe my brother and sister-in-law was around 9:30 in the evening. I was in Altoona and had a drive of 1 1/2 hours to get home and decided to find a hotel. I went to this hotel and was lucky enough that they had a room for me. The check-in person was super nice and made my decision to stay there very easy. The hotel was convenient and the perfect location for me. 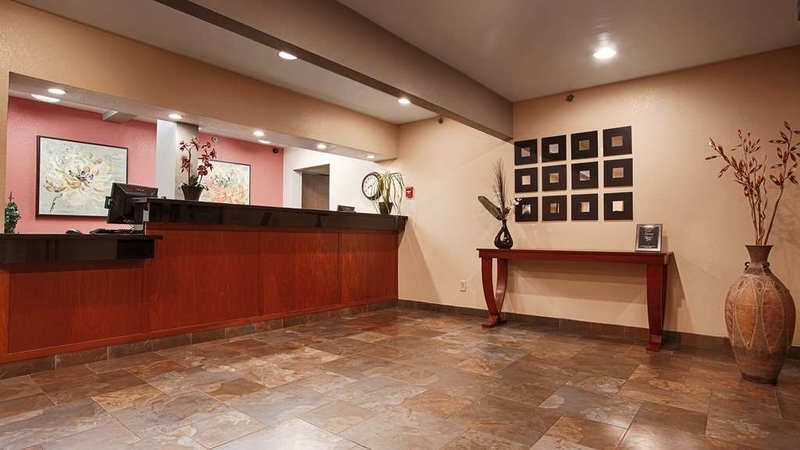 "An excellent inexpensive hotel with great staff"
Comfortable and clean, which is all we needed. Friendly and helpful, which made it all the better. Great staff who helped us through some struggles we were having with an online reservation service. A really wonderful free breakfast, and Wi-Fi available for us, which was very important. Very good price. All in all, highly recommended! Nice hotel, very clean, good breakfast and great customer service. Convenient in town and right off the highway. Staff went out of their way to make my stay comfortable and valuable. Would stay here again and recommend this hotel. The hotel is the closest one to Adventureland. However, that was reflected in the price which was much more than it should have been for a hotel of that type. The service was good, and it was clean and comfortable. The checkout time is rigid, at 11am. They have a sign that you will be charged for another night if you stay past 11am. The breakfast is typical but not appealing. We elected to eat breakfast elsewhere. That being said, we would still choose to stay at this hotel for future visits to Adventureland. The location can't be beat. We walk to Adventureland from the hotel. 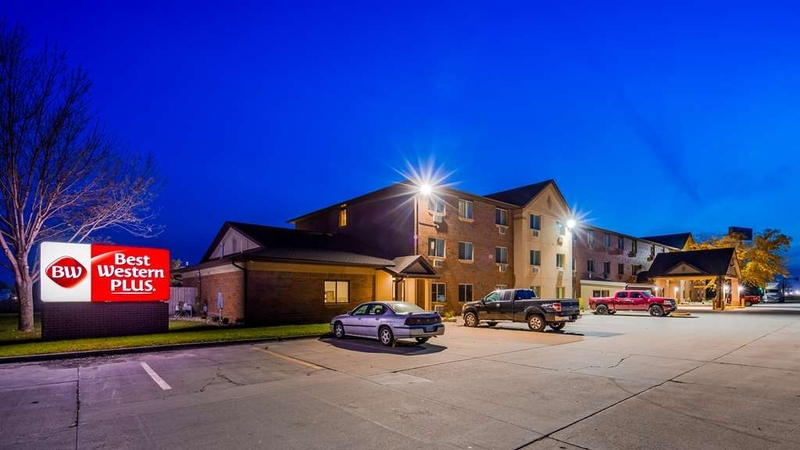 "Good location for Adventureland, property needs a refresh"
This hotel offers an affordable alternative to the Adventureland Inn if you want to stay near the Amusement and Water Park. We booked it based upon reviews of both properties. The 'value for ratings' equation suggested the BW was the way to go. Family traveling with us elected to stay at the Adventureland Inn, so we were able to compare the two. My Average rating is relative to my expectations for a 2 Star property. The property needs to be renovated, or minimally, rooms need to be seriously refreshed with new paint, carpeting and furniture. Water damage and peeling paint was apparent on the ceilings of our first floor unit. The room had a strong musty smell - humidity and moisture seem to be a problem here. Grime was visible and sticky to the touch on the blow dryer power cord in the bathroom. Light bulbs were burnt out in several fixtures. The room was otherwise acceptably clean. The included breakfast was typical for this format, though the breakfast room was too small to accommodate all of the guests who were attempting to eat. It seemed that they were understaffed for two reasons. First, when we arrived, the sole staff member was on the phone taking a reservation, had a second caller on hold to place another reservation, and eventually got to us for our check in. This was mid afternoon on a Saturday. Second, requesting a 1 hour late checkout time was not accommodated on a Tuesday morning, but a 30 minute extension was offered with the statement "but it's a real hardship for us." My assumption is that they didn't have the staff to turn the rooms in time. We declined and left before checkout time. A visit to our family's accommodations at Adventurland Inn revealed a much nicer property. Without going into details, I'd rate it a 4 for a 3 Star property. The pools, onsite restaurant, and other amenities make it the best place to stay near the park - even for the premium rate. We vacation here every July 4th - next year it's back to Adventureland Inn. We like staying at this hotel since it's close to the Prairie Meadows Horse Track. A shuttle from the casino is also provided for pick up at this hotel which is a big plus. Mary assisted us in making sure the shuttle was on it's way. She was most helpful as we appreciated her taking the time to do this for us. Thank you again Mary! Very comfy beds!! Friendly service, cookies and popcorn in the lobby at night. Others were complaining of rooms being humid, but mine was great. Very clean too!!! Will stay again when in the area. It would be a great spot for a family stay with Adventureland being right across the street! "Not as nice as we expected." 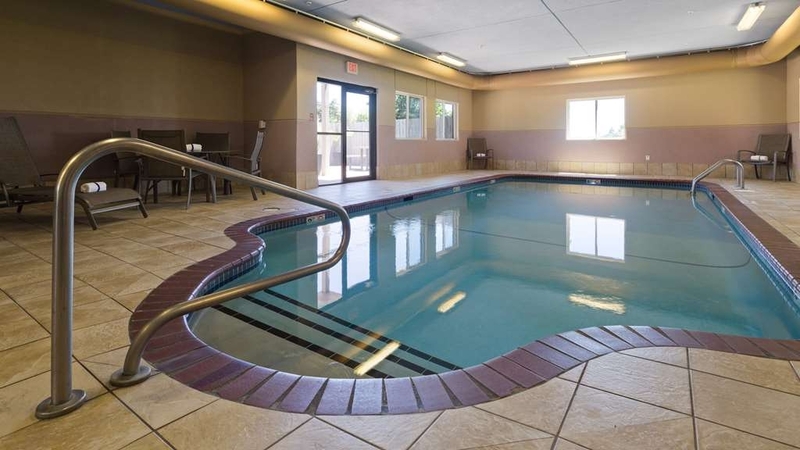 We have stayed at many Best Westerns over the years of vacationing and business travel. The room was very nice. The hallways had dirt and debris in them. The pool was very small, and so was the breakfast area. Many guests had to eat in the lobby without tables. "Good location and helpful staff." Good value for the price. Good location. Plenty of parking. Friendly and helpful staff. Comfortable beds and hot fresh b-fast. They treat you like family, well the ones you want to be around. Thanks, Mary. Best Western has excellent customer service, the front desk agent was able to attend to my needs when my room key did not work the first time, she went up to the room with me to make sure it unlocked my door properly. The check out process was quick as well, taking only 1 minute. Everything about this hotel was good for us. 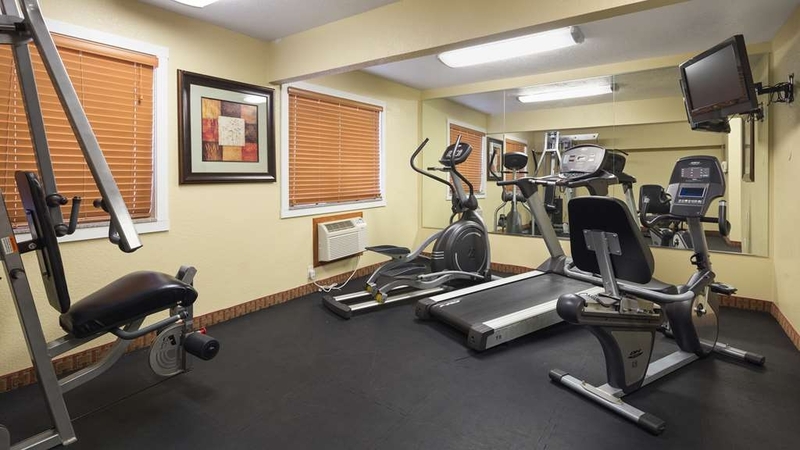 Friendly, helpful staff, very clean and comfy room, indoor, saltwater pool, nice, hot breakfast and within walking distance (just across the street) to Adventureland! I would highly recommend this hotel to anyone. I really enjoy staying here! This hotel is very clean and the staff are very kind and will go out of there way to make sure your stay is stress and worry free. Mary at the front desk is very nice and helpful.Thanks for the pleasant stay ! The rooms were quaint but nice! Clean and tidy. Breakfast was very good. Adventure land was just across the road so it was a quick walk without having to pay the 10$ parking fee! Mary who works the front desk is an absolute sweetheart and incredibly helpful. Will definitely stay again! This hotel is average at best. The rooms are small and the furniture in them are HUGE making them feel even smaller. The shower dripped throughout the stay and the shower curtain holder was broken so the shower curtain never stayed closed. The toilet ran on and off as well. The breakfast was okay- we stayed on a weekend where there was a youth baseball team staying at the hotel so the staff seemed less than thrilled with number of folks trying to grab breakfast. I overheard staff comment about the food and that once it's gone that's it and this was before 9 a.m. and breakfast was supposed to last till 10. My family would have liked to eat before 9 but the breakfast area was packed. The worst treatment we received was around 11 p.m. My extended family was gathered together after a family reunion in the lobby area/breakfast area. There were several other guests there as well. We were told that at 11 we would need to relocate and were given two different areas that we could go. We relocated to one of those areas right before 11 and within a few minutes a new employee came to this location and addressed us and said we would need to move again, that our noise level was too high, that other guests could hear us because their windows were open. It should be noted that as I type this over an hour later that it is still 82 degrees out so no one has their windows open. When questioned about the discrepancy with what we were told about were we could go the employee said he is in charge now. He was rude and treated my family like we were children and most of us in attendance were over 55 years old. When I left the area and entered the hallway to head back to my room no noise whatsoever could be heard and there were multiple family members and other guests still in area that was not approved. Needless to say the great evening of family fellowship was ruined. I will not be staying at this hotel for future family get togethers and will not be recommending it to any family or friends. 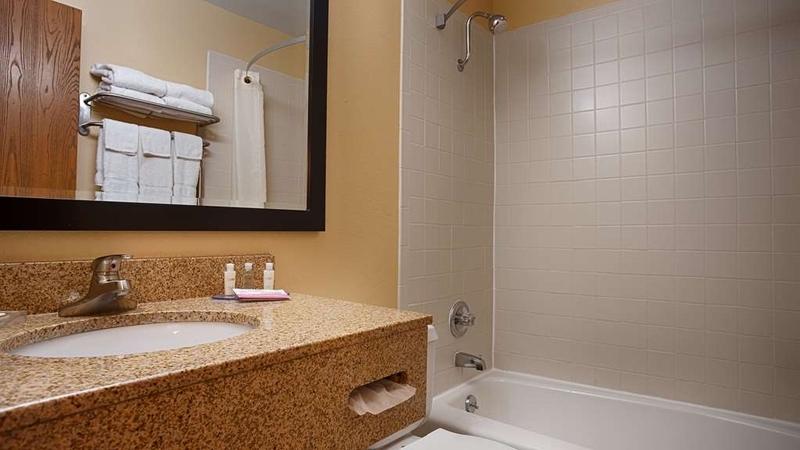 Ok hotel - a little expensive for small room/bathroom/pool. Seating area for pool was large and fitness facility had a lot of equipment in small area. There was also not enough room for everybody to sit in breakfast area. "Rate far too high for quality level of room"
The check in ladies are the best. Mary was the one who helped me and she has to be one of the kindest people I have ever met. They had fresh cookies and milk waiting upon our arrival. You can't ask for much better than that. So glad we chose this hotel. The hotel was clean, pleasant, breakfast was good. Check in was quick and easy and I had no problems. The bed was large and comfortable. The bathroom was clean. I enjoyed my stay and would bring my kids here. 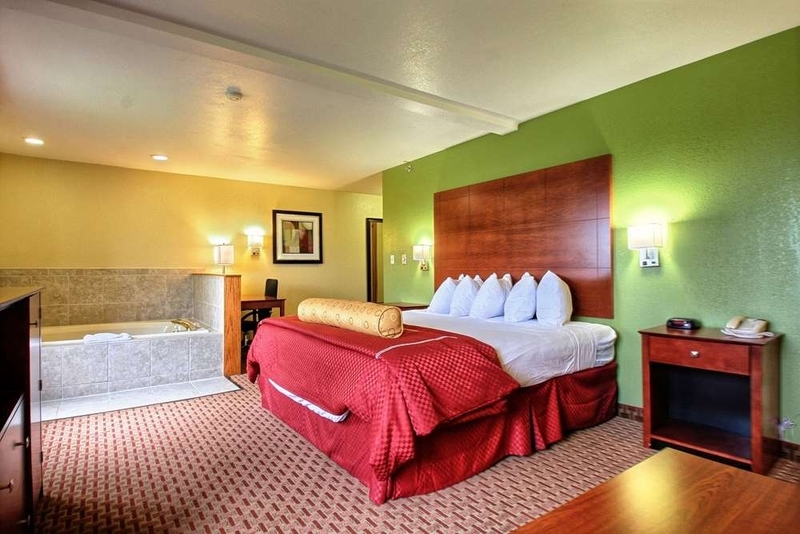 "Consider this hotel for a casino or amusement park stay"
This hotel has a great location for visiting Adventureland Park or Prairie Meadows casino. The bed was comfortable and so was the room. I swam in the indoor salt-water pool and it was warm. There isn't a jacuzzi (whirlpool). The staff members were pleasant and helpful. The hotel offered a free breakfast, but the flow of people to access the breakfast was not well designed and caused delay. The staff at this hotel was very friendly, helpful, and accommodating. Kim did an excellent job keeping the breakfast area well stocked with fresh food & hot coffee! Rooms were a little small, but were clean and comfortable. I would definitely stay here again. Front desk staff was outstanding, especially Karla. She had several restaurant recommendations as well as suggesting we save a few bucks on the parking at the amusement park by leaving our car at the hotel. We stayed 2 nights and were not disappointed. Room was clean, breakfast great, and we slept well. This was a great choice for us right across from Adventureland. Will definitely stay here again for our future visits to the amusement park. As always, my stay at the Best Western was great. Everything was very clean and accommodating. Staff is always friendly and helpful. Mary is great to work with along with Carla. Breakfast is pretty good for a continental, with some hot dishes. It is close to many venues and good restaurants. I would recommend this as a great place to stay for a night or a few. Wonderful breakfast, nice hotel, rooms were clean and popcorn in the lobby. We were walking distance to the Amusement Park, saved $10 on parking. Staff was very friendly and helpful, they also told us about discount tickets at Casey's Gas station. I made this reservation ahead of time based on TripAdvisor reviews, and I wasn't disappointed. We were traveling from Indiana to Colorado, and it was a great place to stay overnight. Clean, good breakfast, and very courteous and helpful staff. I would highly recommend this hotel and would stay again if the occasion arises! We arrived late because we was traveling out west. Great place to stay. Staff was very friendly and accommodating. Full hot Breakfast bar. Room was nice size and very clean. Would highly recommend this hotel and would stay there again. The entire property is really clean and the staff is always friendly and accommodating. I've been staying here on regular business trips for over a year and it's one of my favorite hotels to stay at. Mary is always very helpful and a joy to do business with. 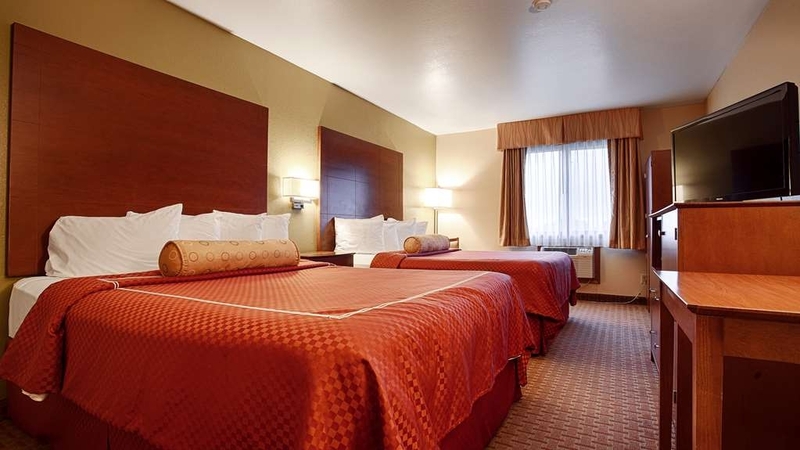 This hotel provided great service, and excellent location for food, shopping, casino, and amusement park. Also it was a location that provided a central home base to travel to other cities in central Iowa. Great location, facility, and staff! Especially Mary, gives great advise on sites and is very welcoming upon your arrival. Location is perfect, next to casino, bass pro shops, and adventure land. Plus great food at Jethro's Pepperoni! Mary is an amazing person, and helps us with anything we need. You have the best helpers in Altoona! They also made cookies that were perfect and have outstanding breakfast!! The hotel is a fair price, and a good surroundings. They have a good comfy lounge and makes me feel somewhat at home. They are very organized and respectable people. They give a helpful smile to everyone! Mary is THE BEST and Kim in the breakfast room, and Will, it was the best stay of my life and I'm sad I won't get to see my ladies anymore because I'm a senior and I won't run here again, I also loved the cookies they made, they were delicious, Mary is cute?????? Mary is the nicest lady you will ever meet. And Kim is a great breakfast room women. Best hotel in The metro area. This is a great stay and if you're going to the state Track meet or any other event or activity come here. Also mary made my track team cookies. "Tremendous Hotel with Awesome Staff"
I travel on a weekly basis with my job. Thus I spend a great amount of time in airports, rental cars and hotels. When I am in the Des Moines / Altoona, Iowa area the Best Western Plus in Altoona has been hotel for over 20 years now. Thus my stays there date back to the days before it became a Best Western Plus. While the hotel is always clean and the beds comfy, it is the staff that means the most to me. It is not uncommon in my travels to change hotels for one reason or another. That thought never crosses my mind here. I love the staff and the hospitality they provide. Robyn and Karla do an amazing job of providing customers with tremendous service and hospitality. I always look forward to my travels to the Des Moines/ Altoona area and getting a chance to see them. And for me no visit is complete to the Best Western Plus without crossing paths with Barabara in housekeeping. She is a tremendous lady that does a great job of representing the hotel well. Some faces and names may change from visit to vist over the years, but you can count on being greeted with warmth and sleeping well in this quality extremely well maintained hotel. Thanks Robyn, Karla, Barbara and the rest of of he Best Western Plus staff for your tremendous hospitality visit after visit. This is my home away from home. I check in in April and I check out in December. I get the best customer service from Mary making cookie at night. Will and Anthony the night audit having breakfast ready when I leave for work. Tiff and Pam keep my room clean. Karla, Kim and Robyn make sure I have the same room for my stay there. This is a great place to stay! very friendly people and know who you are when I call in. Very good breakfast. The rooms are very clean. The service is excellent. could be a little more room for truck parking. But I have a place to park the trailer. have to drive a bit to get something to eat but the places are not all that far away. We like staying at Best Westerns and this one did not disappoint us. Very friendly staff and great service. The breakfast bar was loaded with lots of choices including the great pancake maker. We would stay here again. "Our Spring trip accross Iowa"
Pleasant stay for an overnight stop. This hotel is easy to get to from major highways. The furnishings were nice. The staff was helpful and the breakfast was ready to go when we were. Overall, a pleasant experience. "Excellent price, Room very Big,"
Check in as usual very easy, we are Harley Davidson Platinum card holders, called and made reservations on phone, was there for funeral, very clean, our room lower floor, last room 101 NS, king bed, very comfy, mini fridge, cold for beverages! yeah! had trouble with not getting all channels, but Mary, at desk refreshed it and Viola! all channels instantly. No problems. Clean, Nice indoor pool, wish I would have gotten in, but was sick. was there for funeral. Mary at front desk, wonderful, No problems, Lots of parking and quiet! Thanks! Hotel is very nice and relaxing. Mary went out of her way to make sure I was taken care of. She was very friendly! I would highly recommend this hotel. The pool is salt water and very relaxing. The complimentary cookies and popcorn were very nice. The breakfast was a good selection. 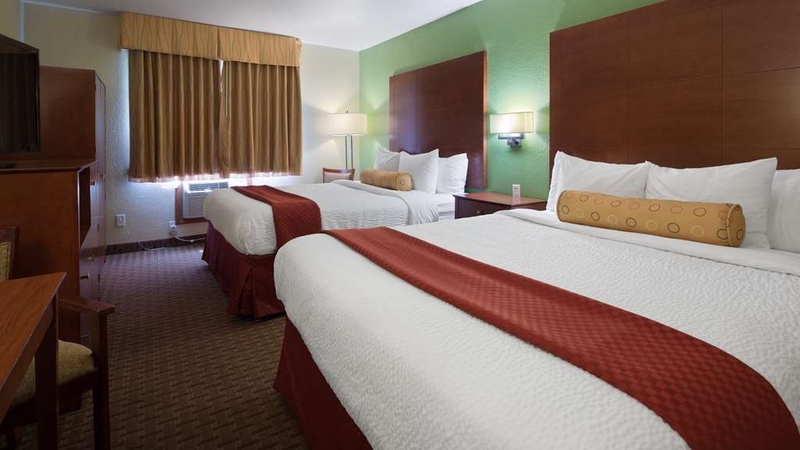 "The service turned an average motel into an excellent experience." Mary was awesome. All of the staff was very friendly and helpful, but Mary went far beyond my expectations for hotel staff. I give her an 11 on a scale of 1 to 10. The staff, as a whole, went out of their way to make sure that our stay was a good experience. The rooms were smaller than I would have liked, but the service we received will result in return visits. "Karla at the front desk was great!" Karla made my limited time with family so much nicer with an early check in.We all enjoyed the pool area.Too bad maintenance of pool cant be done at night while guests are sleeping.We will be back-Karla you are the best!! My truck was down for repairs and Mary Ohland was the BEST!!! I've been in Retail and Restaurant Management for over 25 years and she gave me some of the GREATEST experience that I've received and I travel a lot! Koudos to Mary. "Great Staff Clean Rooms Excellent Customer Service "
I have stayed at this facility a handful of times. The staff are always cheerful and pleasant and have come to know me and my travel mate by first name. The rooms have always been clean and tidy. The complimentary breakfast is a yummy bonus!! Karla and staff do a great job at this hotel! "Very welcoming staff, quiet, comfortable, affordable place!" I have stayed there several times over the past year. Karla and the entire staff are so wonderful and positive...From the cookies when you check in, information about the community, to a great breakfast , they will go above and beyond to make sure your stay is nice! I greatly appreciate everything...!!!! I travel weekly and this is my favorite place to stay, everyone is very helpful. Karla remembers my favorite room and always has a cheery greeting in the morning; all the ladies here are great and will make your stay comfortable. "Where's the PLUS at this Best Western?" My stay at this hotel was typical of a Best Western. I find it hard to see where it becomes a Best Western Plus. The furnishings seemed to crowd the room, but overall the stay was comfortable. I am glad for that. If I am ever back in the area I would stay again, knowing what I am getting. "Fery comforting, and Home like personal stay"
In the past year This has been my home, the staff is wounderful, Mary goes out of here way to make it feel like home to me, breakfast is always ready early, and everyones always happy to see you :) Mary Is truly the Best... she deff goes above and beyond to make your stay comfortable!! 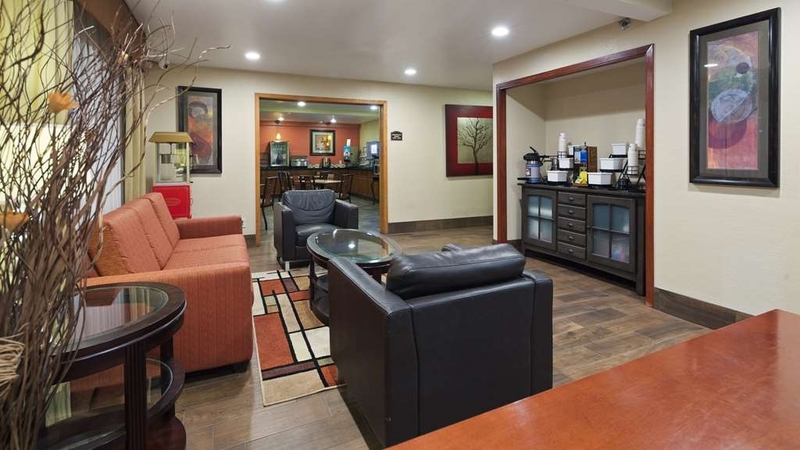 I travel frequently and the Best Western Plus in Altoona has always been a good place to stay. From reserving my room until I check out, I find exceptional customer service. The front desk staff take time to greet everyone and say something nice to each customer. The lady who works in the morning breakfast room always smiles and greets everyone. I wanted to mention that Karla takes the time to make sure the customer feels welcome. A great hotel and it's close to restaurants. I spend about 150 nights per year in hotels and the Altoona, IA Best Western is by far my favorite. I feel the most welcome and appreciated there of all places. I especially appreciate the way Robin and Karla are always prepared for my arrival! "Mary was a rock star!" A very nice hotel, perfect for our needs, and Mary at the front desk was a great help when our Expedia booking had some glitches in it. The hotel is nice and clean, the breakfast was way above average, and we would definitely come back to this hotel again. Excellent! 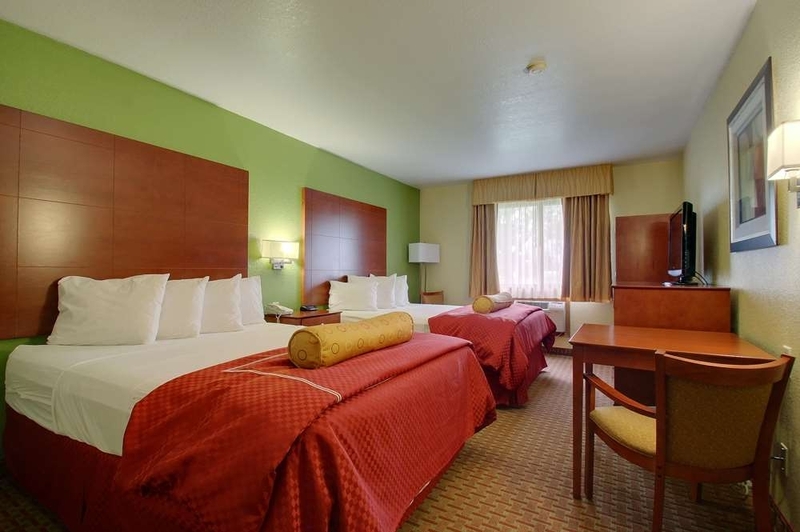 Excellent service and comfortable rooms! Karla and crew always make you feel like family. Great restaurants within walking distance of motel. Bass Pro Shop is also nearby - within 5 minutes. Close to Ankeny and downtown Des Moines and easy access from the interstate. I stay at this Best Western every time I am in town for business. I am always very satisfied. They always get me in and the entire staff is always great especially Karla and Mary. very friendly people. Breakfast is always good and it is also a very quiet place. "Best Western / Altoona, Iowa "
Every time I come to Altoona, Iowa I get treated with respect and Mary who I often check in with knows me by name. When she sees me she already is checking me in and treats me with one of her amazing home made cookie's. Will definitely always stay here when I'm in Altoona, Iowa. 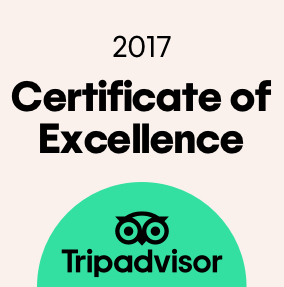 We have stayed here many times in the past year and have always had a good experience. The breakfast is exceptional. The rooms are a bit small, but have all the amenities that you need. We have had great service from all the staff and always feel at home there. We were greeted with a very friendly welcome after our 9+ hour drive through a snow storm. We were given a snack and menus for local places that would deliver. We always slept in and missed housekeeping, but they'd just circle back for a clean room everyday. I needed to throw a load in the washer after hours so the front desk clerk happily opened the laundry room for me. I have never stayed at a hotel with the level of service this hotel provided. It was mostly very quiet. There was a New Year's party there that was cleared out before we got back in for the night. The place is very clean and aesthetically pleasing with a few repairs needed. Our only complaints are we were next to an exit and on the first floor and it got noisy some nights. Also, when I left something behind, it took some difficulties getting it back, but the manager rectified the situation completely. I would strongly recommend this hotel to anyone. Good service, clean rooms, mostly fair price, great breakfast, clean rooms and very close to where we went every time. Staff was very helpful. Left some things in room, they contacted us right away. I would recommend this Hotel to people. Better than most!!!! The room was adequate, clean, and well maintained. The front desk is attended by three lovely ladies with wonderful personalities. They are awesome. Carla is the 1st shift attendant and Mary takes care of the second. I really enjoyed their company and hospitality. This was one of my best stays in my travels over the past year. The breakfast is better than most as well. I will certainly be staying again soon. "Room and Sheets Smelled Like Smoke"
I hate the smell of cigarette smoke and just spent the night in a non-smoking hotel that somehow managed to have a room that smelled like my chain smoking aunt's living room. This place is dirty and smokey. There are hundreds of other hotels in the area. Stay at those. Everything was fine during a 4 night stay in Oct., 2015. However, the room with 2 beds was very crowded for two people. A night OK, but 4 nights crowded got old. A 30% larger floor space would have been customary and appreciated. The front desk lady was extra helpful and generous. She cut me a good deal and was forthcoming with info about the surrounding area regarding work and food. Couldn't ask for a warmer greeting or better service. great place to stay, staff really great! pool is really nice! Had one staff member that checked us in, save 3 cookies for our daughter because we had to be somewhere else and didn't get back in time. This is a really nice place. "Great Hotel and customer service"
We were there for pleasure twice and three times for my husbands medical (cancer treatment). The staff was great! Breakfast very good. Overall best service we have received at any hotel! I would recommend them to everyone. We will be returning. This is a hotel where people stay and where people work and the workers are very nice and the people go out of their way to make a visitor comfy. Also it is in an area where the sun rises every day and the there are good restaurant and a Walmart very near plus a casino and an amusement park. "Nice and convenient place to stay. Good value"
My only complaint is the condition of the windows in my room. For some reason the aluminum window frame was not square and the window wouldn't seal all of the way. I was able to stay warm enough in the room, but the wind would whistle in the crack. Fortunately I was really tired, so I slept well. We came in very late, staff was nice and made us feel welcome. We had reserved a King bed deluxe. Room clean, quiet, bed slept well and enough pillows. Breakfast had enough choices for everyone. We would recommend this hotel and very much stay here again. "Male Hotel Empolyee or Manager not Accomodating"
Women desk clerk very accommodating. Called and talked male employee/manager(?) before and he was not accommodating to our request for extra plillows. He said the room had enough and would not provide any extra. Wife has bad back. Toilet very close to vanity to allow easy use of. Great place to get a good night's sleep. No loud obnoxious kids in the winter, yeah!!! Good location and employees were top notch. My room was amazing for the price paid. Coffee was on the plus side as was the breakfast ensemble. All of the employees that we dealt with with great. Very comfortable bed, clean room as far as hotels go, and a great salt water pool. Breakfast was good with Eggs, Sausage, Biscuits and gravy, pancakes, fruit etc: Would recommend. Very close to shopping for essentials for travelers. The staff was very friendly and helpful. They gave me excellent directions to several places we wanted to go to. Our room was very nice. Beds were comfortable. Breakfast was adequate. Location is handy for where we wanted to be and go to. We would definitely stay there again. Judy M- What wonderful words on the staff here at the Best Western PLUS Altoona Inn. It warms my heart to how wonderful they treated you. I am very happy to hear that you were able to enjoy yourself. We look forward to talking care of you again when you are visiting. Have a wonderful day!!! Robyn Smith- General Manager Best Western PLUS Altoona Inn. My son had a baseball showcase over the weekend so we decided to stay overnight rather than travel back home to eastern Iowa. Room was clean and bed was comfortable. Breakfast was good. I would stay again. Matt M- We appreciate your writing this review on your stay. I'm glad you were able to get a good night sleep and fill your bellies in the morning. We look forward to seeing you in the future. Have a great day!!! Robyn Smith- General Manager Best Western PLUS Altoona Inn. We were traveling from Minnesota to Missouri for a dance weekend. We stayed at the Best Western Plus in Altoona, IA to break up the drive. We arrived around 9pm and were able to check in without reservations. The service was excellent and the room was clean and comfortable. Everyone we had contact with was very friendly and helpful. The price was also quite reasonable. I would highly recommend this hotel. "Our stay in Altoona, Iowa on way home from Yellowstone"
We needed a place to stop for the night because we had been driving since 5:30am from Cody Wy. We could not find the Best Western in Omaha Nebraska because of construction. This hotel and staff was very nice when we checked in at 10:30 pm. "Jagged tile on whirlpool tub split daughters head open"
Title says it all. Dropped the money for two rooms, one with a whirlpool, my 3 year old slipped on the really slick tile (it wasn't even wet) and split the back of her head open, we spent the whole night in the ER (lutheran), they stapled her scalp back together and then the hotel had to think about whether we could have a late check out, did not refund the money, did not apologize, did not offer to pay the medical bills and were trying to shut/slow breakfast at 815 and absolutely will not leave it open a minute past 9 am. I paid for two hotel rooms to take my five 10 and under children swimming and let them splash in the big tub. Instead, I actually paid to sit in the ER and eat stale muffins. Well over 200.00 and over a thousand dollar medical bill so far and next appointment monday. 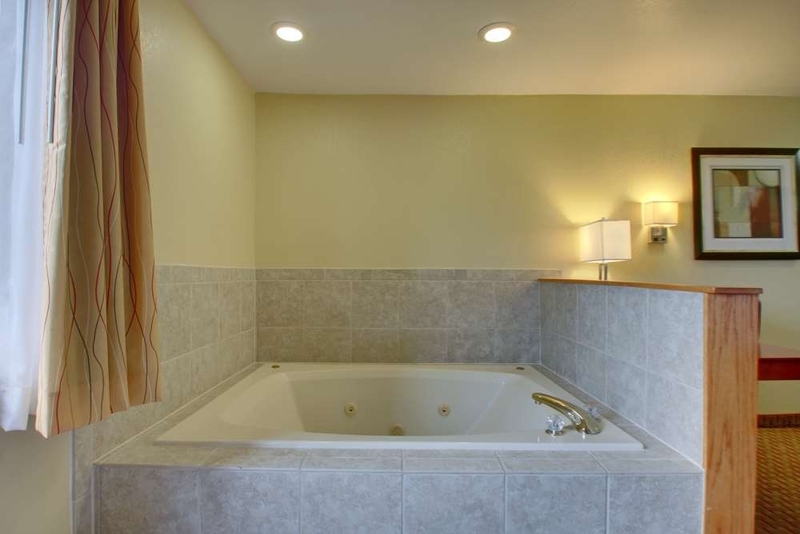 The tub should have been tiled with edge tile which curves, they tried to save a few bucks and cut the tile and butted it. The cut edges are the edge of the tub! Its ragged, sharp and doesnt look like its even sealed there. They never apologized. They ruined my childrens last time with their dad before he leaves for medical treatment related to his military deployment. 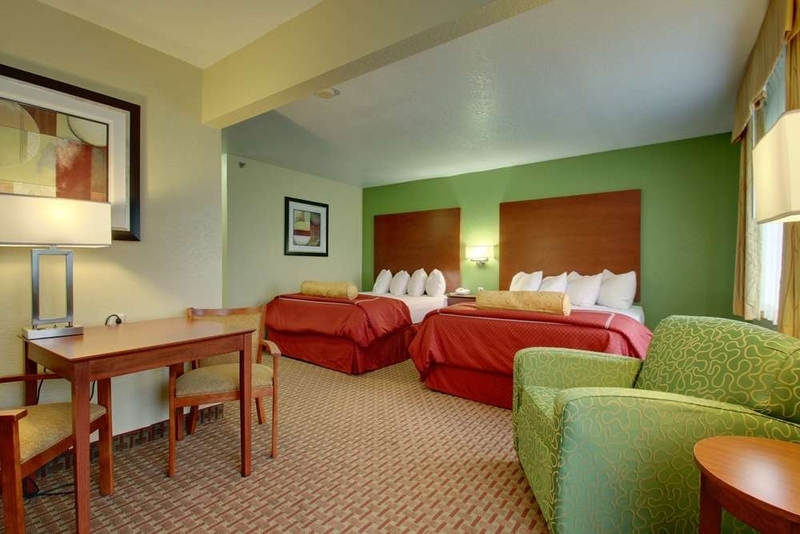 Ashley W- Thank you for your feedback on your stay here at the Best Western PLUS Altoona Inn. On behalf of my entire staff, I would like to apologize that your stay did not exceed your expectations. I would like to discuss your stay further with you. Could you contact me directly at the hotel. 515-967-2400. I look forward to hearing from you Ashley. Thank you and have a wonderful day!!!!! Robyn Smith- General Manager Best Western PLUS Altoona Inn. "Decent Best Western, but could be better." My stay at this hotel was fairly average. The employees and service were fine, but the room seemed fairly small, at least by Best Western standards. The room had most of the amenities that you'd expect to see, but the bed wasn't very comfortable (didn't get very much sleep), and the shower hurt my eyes for some reason. The breakfast was also pretty average. On the bright side, the building was mostly clean, and the hotel is within walking distance of Adventureland. While it's not really a bad hotel, if you're in the Altoona/Des Moines area, I'd try to stay somewhere else if possible. "Kind of run down. Bad coffee." We stay at Best Westerns whenever we travel and most of the time they serve our needs well for a reasonable price. At the Altoona BW, the bed and pillows were great. However, the toilet seat in our room was so loose that it clunked sideways whenever it was used and while the towels were plentiful, they were thin. Worst of all was that the AC blew air that smelled extremely musty. By morning, I'd developed a massive sinus headache, which is extremely unusual for me. The eggs at breakfast weren't over-cooked but the coffee was rancid Folgers (I saw the cans) and the orange juice tasted metallic. In the future, we'll make our reservations at a different BW when we pass through the DesMoines Iowa area.